Successfully Added FlashMax X900 - Heavy Duty CREE LED Flashlight to your Shopping Cart. Introducing the X900, the newest addition to the FlashMax line of high performance Cree LED Flashlights! These are torchlights to get truly excited about. 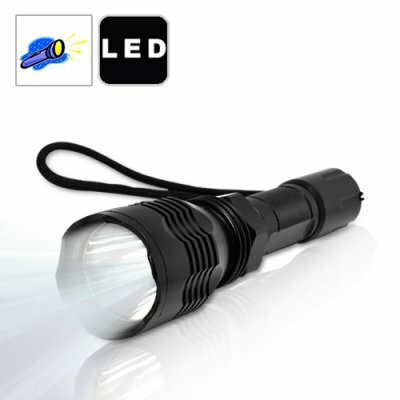 They are extremely powerful, exceptionally durable, and work better than other flashlights which cost 5x as much! Powerful: The secret behind these amazing flashlight torches - they use LED emitters manufactured by CREE, the industry leader in flashlight components. The benefit to you: high intensity beams you can always rely on whenever the need arises. More importantly - LED lamps shine brighter and use less energy than traditional halogen sources - meaning you get more light from a standard sized torch light! Durable: These flashlights employ a precision machined heavy-gauge aluminum alloy casing and have been anodized for extra corrosion resistance. The benefit to you: a high performance device that easily withstands industrial use wear and tear like no other! The Flashmax X900 is perfect for police officers, security officers, military personnel, home use, business use, keeping in car glove compartments, gifting, and especially reselling online. Better than flashlight torches many times their price, this incredible tool with Chinavasion's famous 12 month warranty is the perfect resale item because of its high resale margin potential. FlashMax CREE LED flashlights! Add them to your online catalog and watch your sales skyrocket! Order yours today and we'll ship it out tomorrow! Great News: comes with FREE rechargeable 18650 battery and charger! Excellent Resale Item, our wholesale price on the Cree LED Flashmax series is lower than anywhere else on the internet!